I want to create a menu item for a tag that shows the articles as in category blog layout. I have tried with these menu item types: "Compact List of Tagged Items", "List of all tags" and "Tagged Items" but with no luck. According to the official documentation of content tags, it seems to be possible. Once you have tags and some tagged items you can display them in the front end in several ways. By default Joomla! will display tags embedded in each item that has been tagged. You can turn this display off by changing the parameters. You can control positioning of this display with layout overrides and alternate layouts and you can style it with your css. You can create a menu link that displays a list of tags, with links to the tagged items for each tag. > You can create a menu link that displays a list of tagged items for a given tag and display either as a list or blog style. You can use one of the tags modules. Popular tags will display a linked list of the tags that have the most tagged items. Similar Tags will display a list of items that have a similar set of tags to the currently displayed item (note that this module does not display on pages that are not showing content items). Since this problem seems has been already asked several times and there is still no good answer for that, I'd like to try to provide my solution from the template override side. The steps are quite complex but it should be easy. At this point, introtext and intro image should have been displayed on the the website. 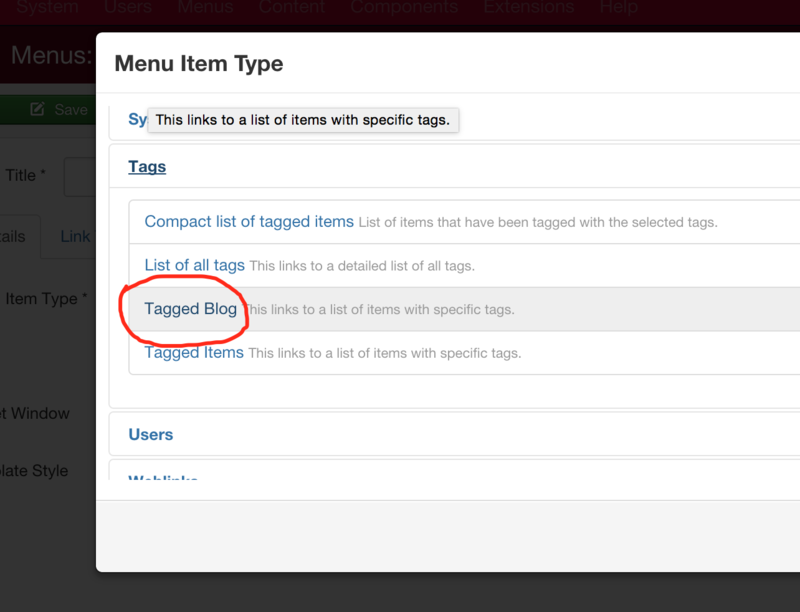 Now try to create a menu item with Tagged Blog type from your joomla menu manager, and see the result. To make things easier, I have uploaded those files above in here. Have fun! This is also currently a request on ideas.joomla.org at http://ideas.joomla.org/forums/84261-joomla-idea-pool/category/12057-content?query=category%20blog%20tagged%20items. You can go and vote for it to be included. So, for each tag, I have a destination article in the format I want accessed by a menu item with the tag name and -articles (for example, tag1-articles). Sure, it's a workaround, but I have got the result I wanted given I can meet the two "conditions" (Apache config access and not many tags) above. Not the answer you're looking for? Browse other questions tagged menu-item tags or ask your own question.